It seemed like a match made in heaven: a Mickey D’s right outside upper George Street’s Metropolitan Hotel. A greasy fast food basin would have been – and for many years, was – the perfect catchment area for empty stomachs hoping to dilute the copious amounts of alcohol they were about to ingest over the course of an evening out. As a name, the Metropolitan has stood on this spot since 1879. Before that, this part of old Sydney town wasn’t so metropolitan. Prior to 1834 this was a lumber yard: thirsty work, so that year it was released from its status as Crown land for development as a hotel, originally the Castle Tavern, and later as the preposterously named La Villa de Bordeaux. Publican P. Wilson’s continental experiment didn’t bring the boys to the yard, and by 1867 the building, which included a dispensary, a tailors and a drapers shop, was empty. 1879’s drinkers were more amenable to the idea of a pub on this corner, and thus the Metropolitan was born. Once the shawl of sophisticated metropolitana fell over the site in the middle of the Victorian era, it wasn’t easily lifted. As with so many Sydney pubs, a brewery took ownership – in this case, Tooth & Co. The excess real estate attached to the building was employed, in 1910, to transform the Metro into a new breed of 20th century super pub. Thus Tooth’s dispensed with the dispensary and tailors, a bottle shop was added to the ground floor, and the neighbouring terrace, built at the site’s inception in 1834, was incorporated into the metropolis of George and Bridge. In the last century the hotel has changed owners a few times. In the 1930s it was the Bateman’s Metropolitan. In the 60s, it was part of Claude Fay’s hotel portfolio. Today, it’s back to the plain old Metropolitan. This lack of ownership qualifier perhaps distills the idea of a ‘Metropolitan hotel’ to its purest essence – it belongs to no one, to everyone. Or perhaps we should stick to talking about the ground floor. McDonald’s and a night on the plonk used to be synonymous, but over the years there’s been a move by imbibers away from processed junk and kebabs, and toward a traditional pub feed. Pubs have seized on the move, providing eateries and “classic” menus in newly renovated wings of what were once snooker rooms or smoking lounges. Even the trusty kebab has been elbowed out of contention by the schnitty. Where did my country go? So in a rare move, this McDonald’s beat a hasty retreat to less discerning pastures. You don’t often see the Golden Arches admitting defeat, let alone leaving up scads of damning evidence of their tenancy here. Poor form too, the Eye Piece, which has opted only to invest in the ubiquitous trend of the pop-up store rather than a real shopfront. As Sydney rent prices continue to accelerate towards Uncle Scrooge-levels of ridiculous money, shop owners have fought back by negotiating shorter terms. This means there’s no need for a total shopfront fit out, which in this case has laid bare the failure of Ronald and associates. Funny choice of location for an optometrist though, isn’t it? Specs downstairs, beer goggles upstairs. It seems like a match made in heaven. Believe it or not, this dump was once D.G.R. Sayburn, an agent of Beale & Co, ‘the largest piano manufacturers in the British Empire’. I guess that’s why the door is extra wide. If I had to speculate (and when don’t I), judging by the Victoria Bitter logo beneath the busted sign it looks to me like this was the bottle shop for the neighbouring Ritz Hotel (which itself has a rich history) sometime in the late 80s-early 90s. After that, this was the Bead Company of Australia. That’s right – if you were in Broome or Launceston and you needed beads, you had to go through these mugs. 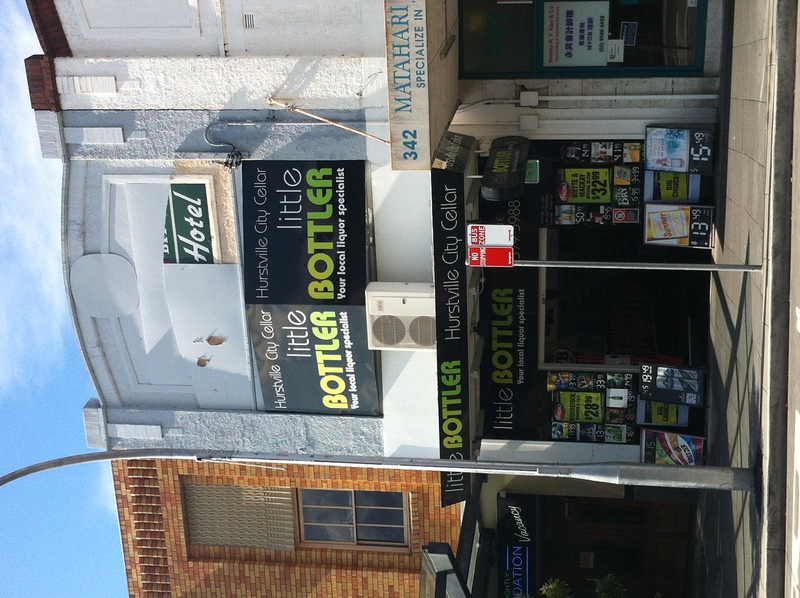 These days it’s returned to its bottle shop state (Hurstville City Cellar – mustn’t they be proud), making you wonder if being a nation’s bead supplier was the apex of the building’s life, and will it now continue to regress until it’s once again a piano shop.